CIDCO Lottery January 2019 final accepted / rejected applications list is published at official website cidco.maharashtra.gov.in or lottery.cidcoindia.com on 11 February 2019. The draw for CIDCO January Lottery is going to start at 14 February 2019 (11 a.m) and the complete winners / waiting list would be published at 6 p.m. All those candidates who have filled the online application forms with a dream to buy flats at affordable prices will be able to check the CIDCO lottery results 2019 (gram panchayat wise) and check the list of winners online in Navi Mumbai region. CIDCO lottery 2018 offered around 14,838 houses under the Pradhan Mantri Awas Yojana for EWS (Economically Weaker Section) and LIG (Lower Income Category) on 2 October 2018. 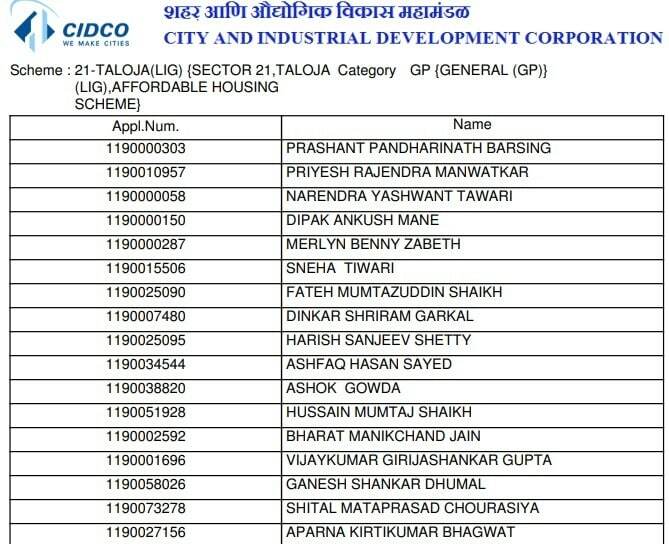 But 1100 houses didn’t receive any response during the declaration due to which CIDCO had decided to issue lottery advertisement for the 1100 houses in January 2019. All the houses were built for EWS category people having average monthly income below Rs. 25,000 and for LIG category with average monthly income between Rs. 25,001 and Rs. 50,000. The carpet area for EWS houses was 25.81 sq.mt. while carpet area for LIG houses was 29.82 sq.mt. The final list of accepted and rejected applications for CIDCO Housing Scheme 2019 is now available at the official website. At the homepage, click at the “Accepted Applications” link present in the header. 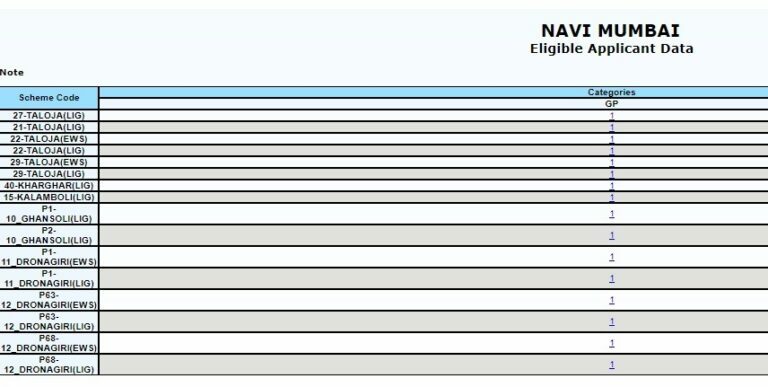 Here candidates can click at the “View” option to check the eligible data of applicants for CIDCO Lottery Navi Mumbai 2019. Here applicants can click at the numbers / links under the “Gram Panchayat” section to view the final list of accepted applications for CIDCO lottery. All the EWS scheme results and LIG scheme results would be available for downloading purposes after the draw of CIDCO Lottery 2019 takes place on 14 February 2019. Candidates can then check their name manually in the downloaded list of selected applicants. 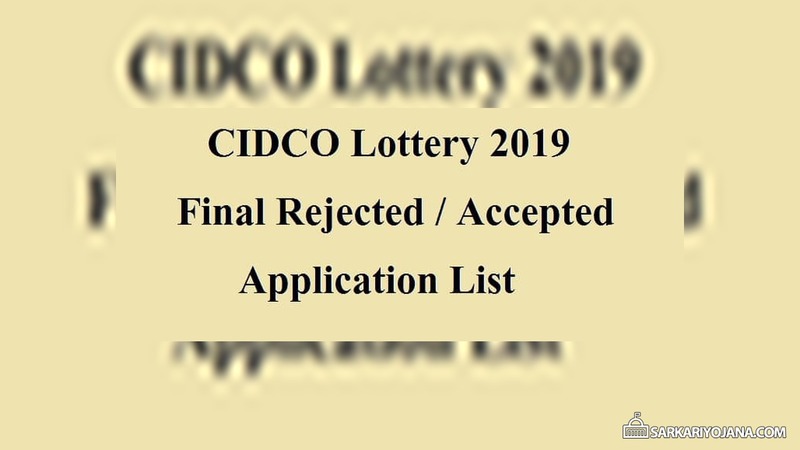 The final rejected applications list of CIDCO Lottery 2019 would then remain available for download directly. The CIDCO Lottery 2019 draw of results is scheduled to take place on 14 February 2019. On the same day, the complete list of winners along with the waiting list would be published on the official website. People can then even apply for refund of their money till 21 February 2019. The helpline number for CIDCO Lottery 2019 is 8448446683. All the data displayed above is taken from https://lottery.cidcoindia.com for the information purpose only.